In 2012, the NFL created new overtime rules designed to make the game fairer. The league switched from a sudden death setup to an arrangement that allows both teams to have a chance at scoring, unless the first team to receive scores a touchdown. Even with this change, it would seem that a coach should still always elect to receive if he wins the coin toss at the start of overtime, since an opening touchdown drive wins the game. However, earlier this year, for the first time under the new rules, a coach made exactly the opposite decision. Bill Belichick, the three-time Super Bowl-winning coach of the New England Patriots, made the gutsy call to kick at the start of overtime. Many considered the main factor behind this decision to be the heavy winds at Gillette Stadium (if a team defers the choice of kicking or receiving, it may choose which direction to face). However, kicking first may also give a team better field position on offense and may actually benefit teams with strong defenses. To calculate which strategy coaches should prefer, we will model NFL overtime as a Markov Chain. We will define our states as the set of possible point differentials, from the perspective of the team that receives the opening kickoff, in overtime: -6, -3, -2, 0, 2, 3, 6. 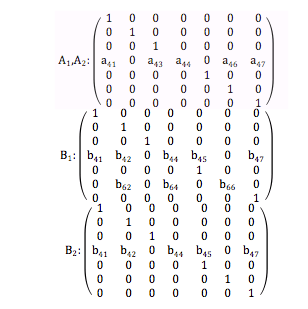 This model inherently assumes that state-to-state probabilities are not conditional, and that the probability of the score differential being 5 or 9 – both technically possible under the new rules – is negligible. We will let be the transition matrix for the receiving team’s first offensive possession, be the receiving team’s first defensive possession, be every subsequent receiving team offensive drive, and be every subsequent receiving team defensive drive. The first row/column of each matrix represents the receiving team at a -6 scoring difference, and so on until the last row/column is the receiving team at a +6 scoring difference. We proceed recursively, alternating between which teams has the ball. This is a reasonable estimate for the probability of the game ending in any one of these potential states. For instance, the probability that the team which first received the ball in overtime losing by 6 is 25.6%. The probability of a tie is 0, which makes sense because after an infinite number of drives, the probability of nobody scoring approaches 0. So, in this simple model, the team that wins the opening coin toss should always choose to receive. 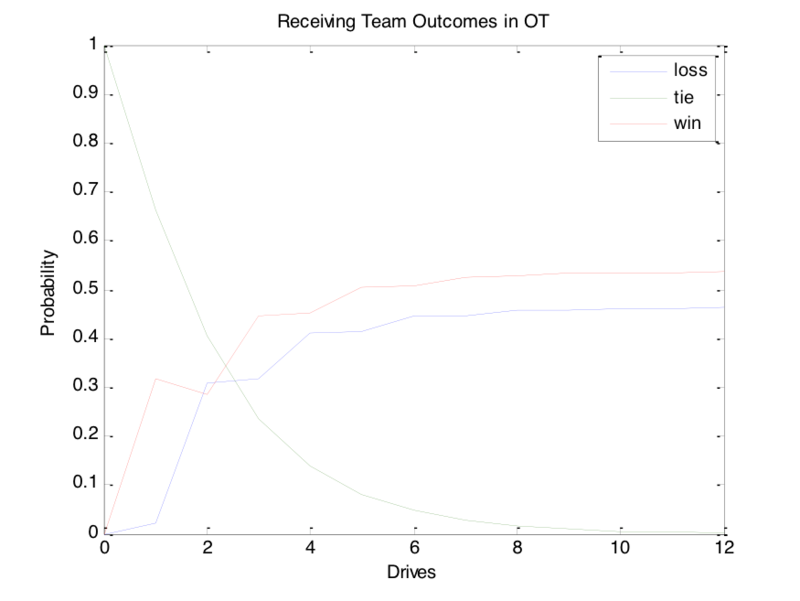 Using identical sums as the infinite overtime model, the probability of the receiving team losing is .446, the probability of the receiving team winning is .507, and the probability of a tie is .047. The count of six drives per overtime period is only an estimate. Therefore, it is more useful to consider probabilities for each team winning and tying over a range of possible numbers of drives. The green curve represents the probability of a tie. It makes sense that this curve can only decrease with each passing drive – if someone scores on that particular drive (with the exception of the new first-possession field goal rule), the game can no longer end in a tie. The probability must start at 1, because the game is always tied after 0 drives have been completed, and it must end approaching 0, because after an infinite number of drives, surely someone would eventually score. The red (receiving team wins) and blue (receiving team loses) curves move further apart on odd numbers and closer together on even numbers. This makes sense, because after an odd number of drives, the receiving team has the unfair advantage of having had an extra drive to try and score. There is technically also a chance for the defense to score on any drive through a safety or a defensive touchdown, but the probabilities are not nearly as high as those for the offense scoring a field goal or touchdown. The red and blue curves eventually reach a steady state, which is calculated in our earlier section on infinite overtime. There is one time-step (after each team has had exactly one drive) in which it is better to be the kicking team. If the overtime lasts two drives – that is, each side get the ball once – the kicking team has a slightly higher probability of winning. For any other number of drives, it is better to be the receiving team. The next step is to include team-specific data. A relatively good offensive team would rather get the ball first in an attempt to score and win before the other side can get the ball. A relatively good defensive team might prefer to kick off to start OT, in the hopes they can stop the opposing offense first. Instead of using league average for all of the constants, we will now use the average of one side’s offense and the other side’s defense. For instance, if the Eagles are playing the Cowboys, the probability of the Eagles’ offense scoring a touchdown against the Cowboys’ defense will be estimated as the Eagles’ offense touchdown frequency and the Cowboys’ defense touchdown allowed frequency. Instead of using 2:34 as the average drive length, we will take the average of the mean drive lengths for each team in question. 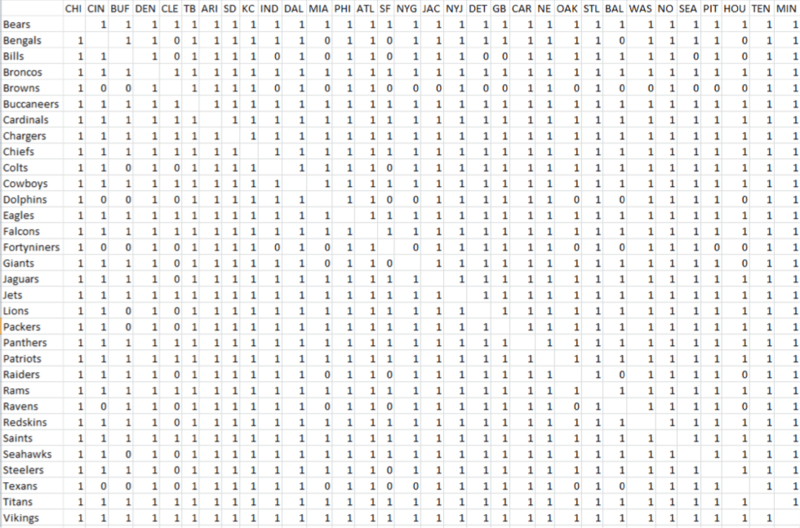 To put it all together, the following is a chart of every possible NFL matchup. A 1 means the team in that row would prefer to receive against the team in that column. A 0 means they would prefer to kick. Note that the table is diagonally symmetric, as it must be. It doesn’t make sense that receiving is a winning strategy for Team 1, but kicking is simultaneously a winning strategy for Team 2. The scenario in which Team 1 receives is identical to the scenario in which Team 2 kicks, so it must be the case that both of them prefer the same thing. As expected, the majority of entries in the team-by-team table are 1s (92% to be precise, not counting the diagonal as either 0s or 1s), meaning more often than not teams prefer to receive. However, there are a non-negligible number of times when kicking provides a higher probability of winning. An interesting follow-up question is which teams are best equipped for overtime. We will assume that each side has perfect information, meaning they know where all the 0s and 1s are placed in the above table and always make the right decision on whether to kick or receive. Then, since the deciding team is chosen by coin toss, there is a 50% chance of each occurring in any game. We will simulate a 31-game “season” for each team, where everybody plays everybody else exactly once, and all games go to overtime. In general, better teams do better and worse teams do worse, but it is not a strict correlation and there is not much separation between the good teams and the bad. This shows how much variance there is in an overtime when one score is usually enough to win the game. In the regular season, albeit with fewer games (teams play 16 games per year, not 31), there is far more of a range of winning percentages. The reason is that most games do not go to overtime, and are therefore decided by many scores, not just one. This allows the better team to win more often than a modified sudden death overtime setup does. Of course, there are other factors beyond overall team averages to account for. If a key player, such as a placekicker, is injured, that would affect the relative strengths and weaknesses of each team going into overtime. If there is heavy wind in one direction, the coach might prefer to defer the decision on kicking or receiving in favor of choosing which direction his team will drive. If he feels one team is better conditioned than the other, he might have some foreknowledge of how many drives will take place, since players are likely to get tired when asked to play more than their usual 60 minutes of football. With that said, coaches need to consider the data in advance of each game, just in case they end up with a difficult and sure-to-be-scrutinized decision if the game winds up tied at the end of regulation. Wondering about the Wonderlic: Does it Predict Quarterback Performance? I love the use of Markov chains here. Question: how many “seasons” did your simulation allow the teams to play, and did you calculate margins of error due to simulation? Are there significant differences in the end of drive frequencies at the end of a game versus the numbers you used? Not sure if it’s true, but I often here that offenses are more successful late in games because the defensive players are tired. If that effect does exist, could it be strong enough to change this analysis for some teams? Great article. Well written and excellent analysis.